Circuit flushing is a critical maintenance procedure that removes contamination or dirt from an air-conditioning or refrigeration system. Flushing the system clear of all acids and soot, for example, ensures longer compressor life and reliable performance. Circuit flushing involves the cleaning of pipes, evaporators, and condensers of an AC or refrigerant system by means of a solvent. The procedure is usually required in the event of a compressor failure due to electrical burnout or mechanical breakdown. The end result is mechanical debris, carbon soot, and acid formation. If these impurities are not removed, it can result in the failure of the replacement compressor as well. The same result is possible in the event of moisture or dirt ingress into an AC or refrigerant system. In addition, preventative circuit flushing is considered best practice in terms of proactive maintenance, which involves either retrofitting or changing the refrigerant and oil. Current industry practice in terms of circuit flushing includes purging with high-pressure nitrogen. While this is a cheap and therefore cost-effective method, it can only push mechanical debris due to pressure, and it cannot dissolve and flush oil and acids. Flushing with refrigerant is not recommended, due to the possibility of it being emitted into the atmosphere, and thereby damaging the environment. Therefore A-Gas South Africa has introduced the latest-generation circuit flushing solution in order to allow the local refrigerant industry to comply with the necessary legislation. 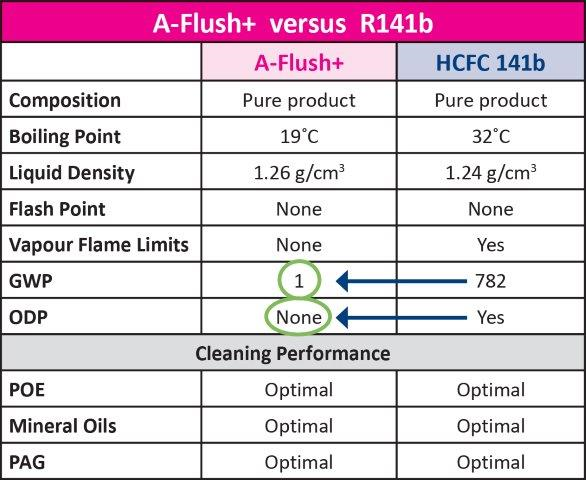 A-Flush+, based on environment-friendly C3H2CIF3 and nitrogen as the propellant, is not only highly effective and non-flammable, but has a low Global Warming Potential (GWP), A-Gas South Africa National Sales Manager Michael Labacher explains. A-Flush+ is suitable for electronics, metal, medical, and precision cleaning applications. It can also be used in vapour degreasing equipment and cold cleaning, and can even be dispensed in aerosol cans. “The main advantage of A-Flush+ is its favourable environmental properties, specifically negligible ozone depletion and a GWP of 1,” Labacher points out. These exceptional ‘green’ characteristics, combined with good solvency due to a high heat of vaporisation, means that the new flushing solution is an excellent choice for a wide array of applications. A-Flush+ is compatible with diverse materials, including stainless steel, cold-rolled steel, galvanised steel, copper, iron, and aluminium. The product is used to flush and clean the components of air-conditioning and refrigeration circuits, including transportation applications such as cars, trucks, buses and even trains, aerospace applications such as airplanes and helicopters, residential and commercial applications, commercial refrigeration applications, and process chillers. In addition, A-Flush+ is an effective cleaning solvent for many common oils and lubricants, including mineral oils, refrigerant oils, vacuum oils, fluorinated oils, heavy grease, cutting oils, silicone oils, and silicone grease. A-Flush+ remains a liquid for an extended period of time, even at room temperature. Its vapour pressure facilitates quick evaporation and drying of cleaned materials. The low surface tension results in good wetting of parts to be cleaned, allowing for rapid cleaning of intricate pieces and parts with small channels. “A key consideration of any flushing solution is the impact on the surrounding area, and the safety of all individuals who come into physical contact with it,” Labacher notes. In particular, the ultra-low Maximum Incremental Reactivity (MIR) means that A-Flush+ generates less ground-level ozone or smog than methane. Another major benefit is that it is totally non-flammable, as it does not have a flash point or vapour flame limits up to 100°C, the highest temperature tested. The new flushing solution is highly effective for aliphatic and fluorinated soils, in addition to silicon and glycol. It is also compatible with a large number of commonly-used plastics and elastomers. A-Flush+ can be recovered or recycled by simple flash distillation, or by means of carbon absorption with steam desorption. There is no issue related to vapour recovery, since A-Flush+ is a pure component, and does not require a stabiliser as it is hydrolytically stable. A-Gas South Africa’s primary focus is providing total solutions to its diverse markets. Celebrating its 22nd anniversary this year, the company is a global leader in the supply and lifecycle management of refrigerant and service gases to the heating, ventilation, air-conditioning and refrigeration industries. A-Gas is a leader in the supply and lifecycle management of speciality chemicals. This includes: refrigerants, blowing agents, industrial gases, halon and fire protection agents used in industries operating in the HVAC, refrigeration, insulation, solvent, manufacturing and medical sectors. Delivering innovative and sustainable solutions for environmentally-sensitive gases and chemicals for 22 years, A-Gas offers a tailored ‘one-stop shop’ solution of products and services, helping its clients meet their regulatory obligations responsibly and sustainably.